I’ve struggled in the past with finding a good vegan sugar cookie recipe, mainly because most of the time they end up too flat or too crispy for my liking. If there’s one thing I crave every day and get sucked in by at the grocery store, it’s going to be those really fluffy sugar cookies with a thick (I’m talking as thick as the cookie) layer of frosting on top. 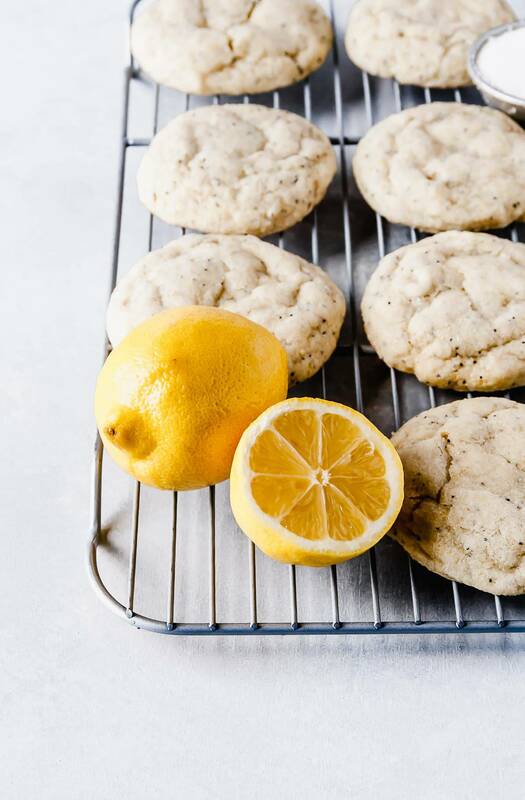 The texture of these vegan sugar cookies with lemon is just about as perfect as those, but even better. They still have that sugar cookie texture, without the crumbly, weird thing that can come along with them too. The best way to describe them to me is that they taste like a REAL sugar cookie if real sugar cookies grew on trees..or something like that? You know what I mean! They taste like real-deal, made at home with love sugar cookies that are just about the best you’ve ever had, but they also have LEMON. So double win. 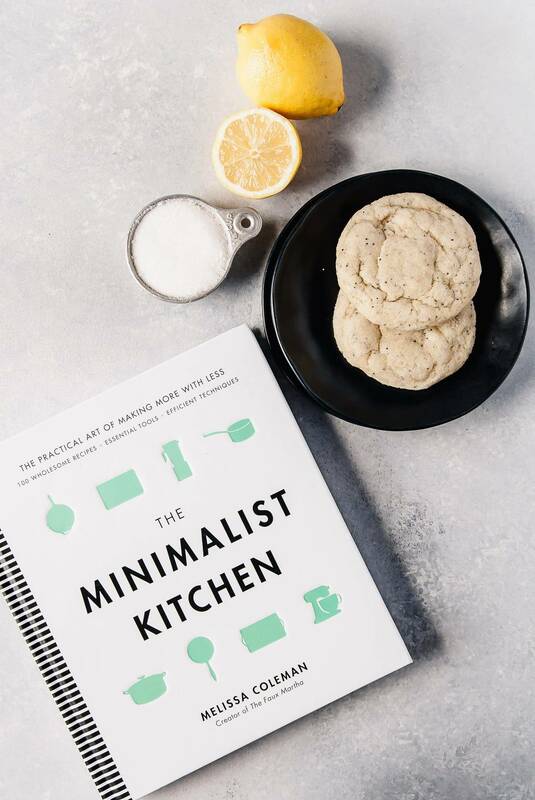 This better than best vegan sugar cookie recipe comes from, The Minimalist Kitchen, the newest cookbook from one of my favorite ladies of the online blogging space, Melissa at The Faux Martha. Melissa and I first met in person a few years ago when my husband and I were visiting Minneapolis for a Twins game. We made plans to meet for breakfast on a Saturday and as I was explaining it to AJ I said ‘I know her, but haven’t actually MET her’. If you’re a blogger you understand that this isn’t THAT weird, but to him, it probably sounded crazy that we were going to meet someone who I met on the internet and hadn’t actually seen in person. Turns out, Melissa is just as delightful as you would imagine her to be (and her daughter Hal is the cutest thing) from her online persona. Ever since then, I’ve been able to see her a few times when I’m visiting the Twin Cities, including having the pleasure of seeing her minimal/dream home goals house in person. Melissa appeals to by minimal tendencies with her smart approach to cooking and paring down the kitchen, while still being able to bring the most incredible dishes to life. I LOVED these cookies because they are a perfect cross between those Lofthouse Style cookies and your favorite homemade sugar cookies that are just fluffy enough, but not too crunchy. 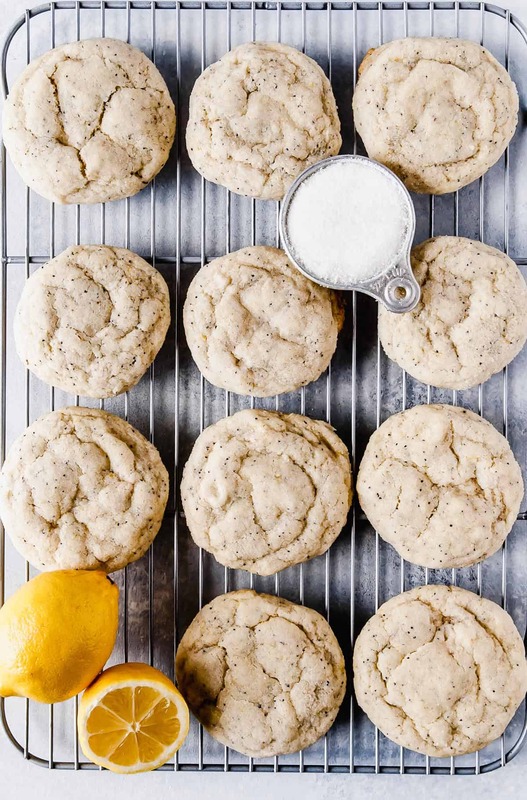 Adding lemon and poppy seeds only further takes them to the OMG YES level by making them burst with flavor with each bite. I’m telling you, these are amazing and I don’t think I can ever go back to regular vegan sugar cookies again. Thank you, Melissa, you’re a true sweets genius! Don’t overbake these! They are going to come out of the oven looking very light and that’s ok! You don’t want to bake them until they are brown because they will dry out and not be the ideal soft, buttery sugar cookie consistency. I would not recommend subbing the coconut oil for more olive oil. Since I subbed it in for butter from Melissa’s original recipe, I’m not sure that it would work as well. Let these babies cool before handling! They are going to be soft and pillowy, but you need to let them rest before picking them up. Seriously think about investing in a cooling rack, it’s going to make your cookies juuuuust crunchy enough on the bottom and it’s so #worthit. 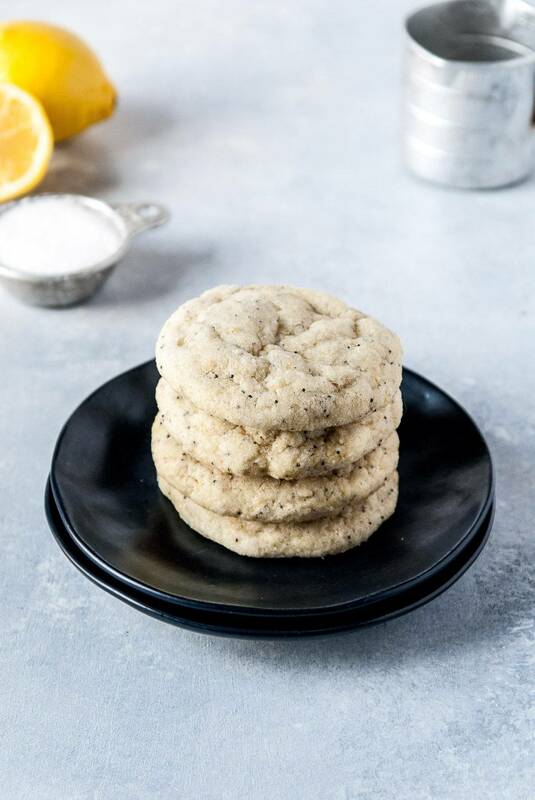 The fluffiest and SOFTEST citrus poppy seed vegan sugar cookies! These are just tart enough, the softest vegan sugar cookie, and rolled in sugar, hello gorgeous! In a medium bowl, whisk together the flour, poppy seeds, baking soda, and salt. In a stand mixer fitted with the paddle attachment, cream together the coconut oil, sugar and zest on medium speed until well combined. Add in the olive oil, ground flaxseed, water, and lemon juice. Continue mixing until pale and evenly combined, about 1 minute, scraping down the sides every so often. Add the dry ingredients to the creamed ingredients, mixing on low speed until just combined. The dough will be dense. Using a 4 tablespoon sized spring scoop (2 ounces), scoop out the dough onto the prepared baking sheet. I used my digital scale to get each to be about 2 oz. Roll or liberally sprinkle each cookie in the granulated sugar. Bake for 12 to 13 minutes. The cookies won’t seem done, but take them out before they start to brown. Let cool on the pan for 1 minute before transferring to a cooling rack to cool completely, about 20 minutes. Store in an airtight container for up to 3 days. You can replace half of the lemon zest with orange zest, or go full lemon zest. If you don’t have a 4 tablespoon cookie scoop, use a digital scale to portion out 2-ounce scoops of dough. I highly recommend rolling the cookies in the granulated sugar vs. sprinkling them. It makes for a much cleaner end result! I know it’s going to feel weird taking these out without them getting golden brown, trust me, they will be delicious. Don’t overbake them or they will become dry. Yesss I need to try these! oh i love the thought of nice lemony cookie! However, i am not in the soft sugar cookie camp by any means. I have never had a lofthouse cookie and have no desire to. Given my weirdness in this area do you have any suggestions on how to make them crisper without being overly dry? bake a bit longer? let them set up on the tray a bit longer? Hi Jacquie, I would say baking them an additional 2-3 minutes should crisp them up a bit more! Hi there! I haven’t tried them with GF flour, but if you do let me know! can I use vegan butter instead of coconut oil? How would you recommend measuring out a cup of solid coconut oil and creaming it if it’s runny at room temperature in my apartment? Hi Matthew, You can refrigerate it for a bit to make it more solid, if it’s too runny!